This year, the celebrity wedding season began with a bang with actress Sonam Kapoor tying the knot with Anand Ahuja . After Deepika Padukone and Ranveer Singh’s November wedding in Italy and Priyanka Chopra and Nick Jonas’ Jodhpur do, the year 2018 is with going to end with the most high-profile marriage of all. Industrialist Mukesh Ambani’s daughter Isha Ambani is all set to tie the knot with Anand Piramal in Udaipur on December 12, and the who’s who from across the world have already landed in the Rajasthan city to be a part of the grand celebrations. The pre wedding functions have started, and several Bollywood stars, business giants and international personalities could be spotted at the Udaipur airport on Saturday headed for the big fat Indian wedding. The celebrations started with mehendi and sangeet ceremonies, and we have got to see the first photograph of the bride-to-be Isha Ambani and groom Anand Piramal in Udaipur. 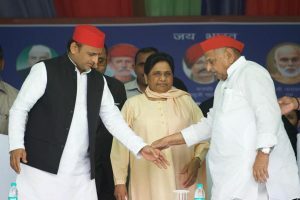 They two can be seen with Mukesh Ambani. The photograph has the father-daughter duo twinning in pink outfits, while Anand is wearing golden. Isha can be seen making her entry into the celebration venue holding hands of the two men in her life. 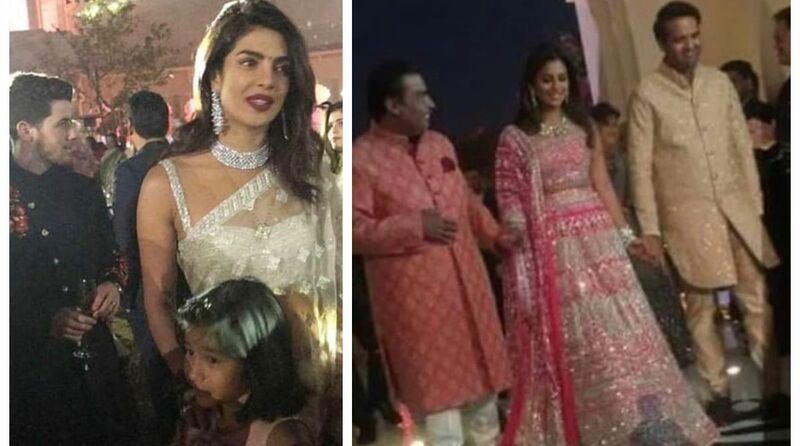 We can also see glimpses of newlyweds Priyanka Chopra and Nick Jonas, besides Katrina Kaif, Karisma Kapoor, Jahnvi Kapoor, Khushi Kapoor, Raveena Tandon with daughter and others. Check the photographs from the star-studded affair. @nickjonas and @priyankachopra snapped at #IshaAmbani and #AnandPiramal’s pre-wedding event. Something that caught everyone’s attention was the dance performances by the Ambanis. One such performance was by Isha’s mother Nita Ambani who danced with her sons Akash Ambani and Anant Ambani to the beats of Mahi Ve from Kal Ho Na Ho. The song turned into an emotional scene as Mukhesh Ambai brought Isha to the stage holding her hand. Mukesh and Nita then danced on title track of Jab Tak Hai Jaan. Here are the videos of the performances by the Ambanis. More ceremonies are lined up as the actual wedding date is still four days away.